Human health has been seriously impacted throughout history by emerging and re-emerging infectious diseases around the globe. In the 14th century the Black Death, caused by the bacterium Yersinia pestis, is estimated to have killed 30-60% of Europe's total population; the Spanish Flu pandemic claimed more than 50 million lives in two swift years between 1918-1920; and today HIV, initially discovered in 1981, still claims approximately a million lives each year globally. More recently there was the 2014-2015 outbreak of Ebola in Western Africa that claimed over 11,000 lives and the 2015-2016 Zika outbreak in the Americas particularly Brazil with over 500,000 estimated Zika infection cases through December 2015. While Zika infection is a self-limiting disease with mild to moderate flu-like symptoms, there is increasing evidence for the development of neurological disorders potentially associated with Zika infection including microcephaly in newborns from women infected during pregnancy and Guillain-Barre Syndrome in some adults. Identifying the causal pathogen is critical to determining the appropriate response, treatment and patient care for any infectious disease. Linking infectious agent diagnostics to clinical decision-making at the point-of-care (POC), requires a fast, highly sensitive and simple-to-use method that takes into account the clinical infrastructure, workflow and patient care settings for both developed and developing jurisdictions. Arisan is focused on developing novel POC rapid and sensitive diagnostic tests for Zika and secondarily, for other related viruses and co-endemic tropical diseases including Dengue and Chikungunya, respectively. 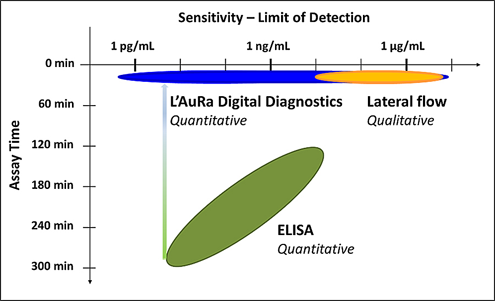 Arisan has identified antibodies to detect biomarkers for both Zika and Dengue and has established a collaboration with LamdaGen Corporation to co-develop high sensitivity and quantitative rapid tests utilizing their L'AuRa Digital platform which is based upon its patented nano-based Localized Plasmon Resonance (LSPR) biosensors. The POC/mobile platform has significant performance advantages over existing diagnostic technologies (ELISAs and LFAs), including speed, simplicity and sensitivity (Figure 1).